The Story of Operation CUBE fits between Area 5 and Cube Plus will fit into after Area 7 when it gets released. 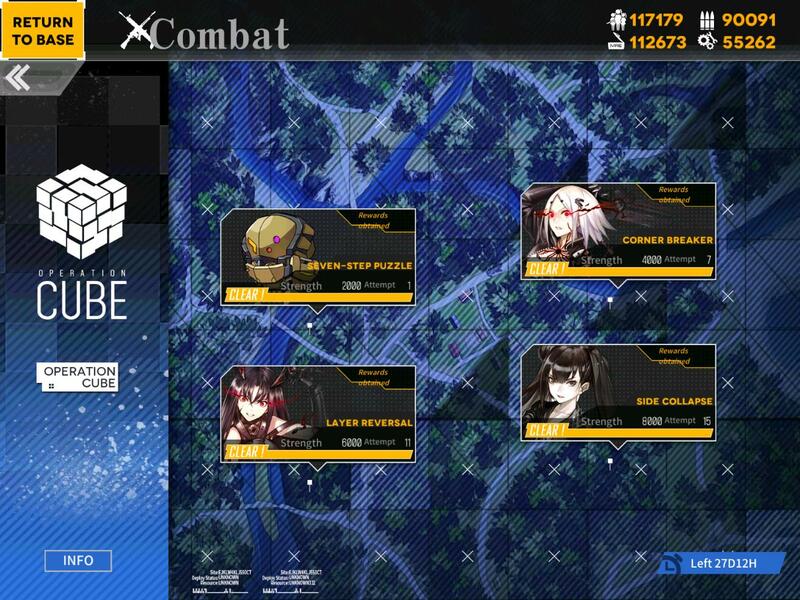 Welcome to Our First Campaign Mission in EN server: Operation CUBE! 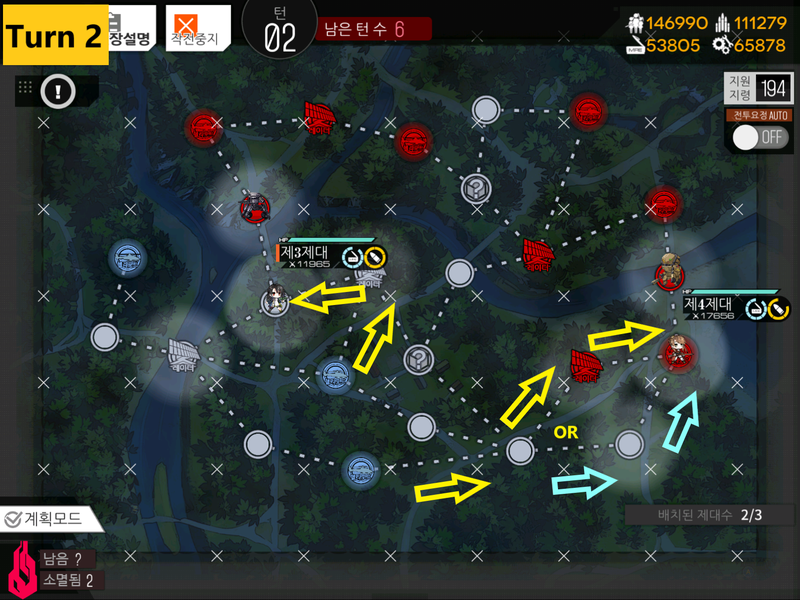 I have gone and used the Korean Server images for the guide since it was not officially released in EN server at the time of writing. 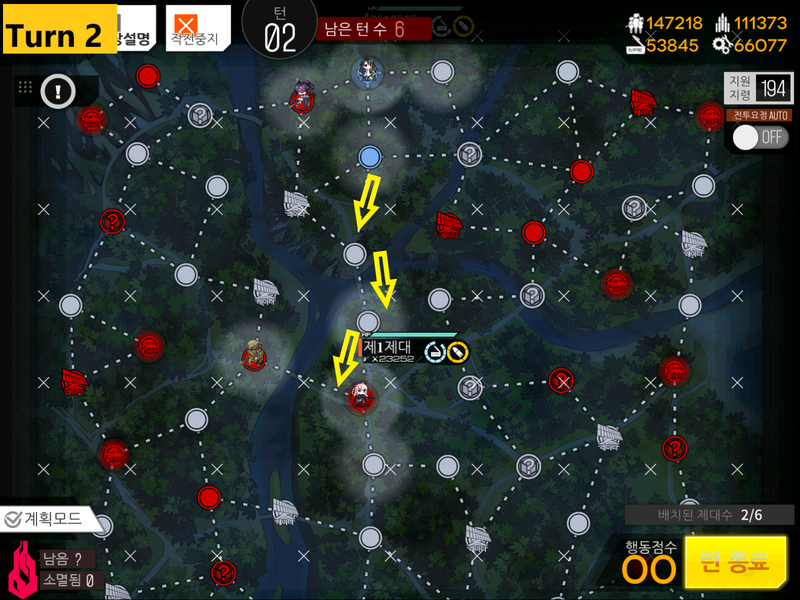 For difficulty of the Campaign Missions, it is not too difficult. 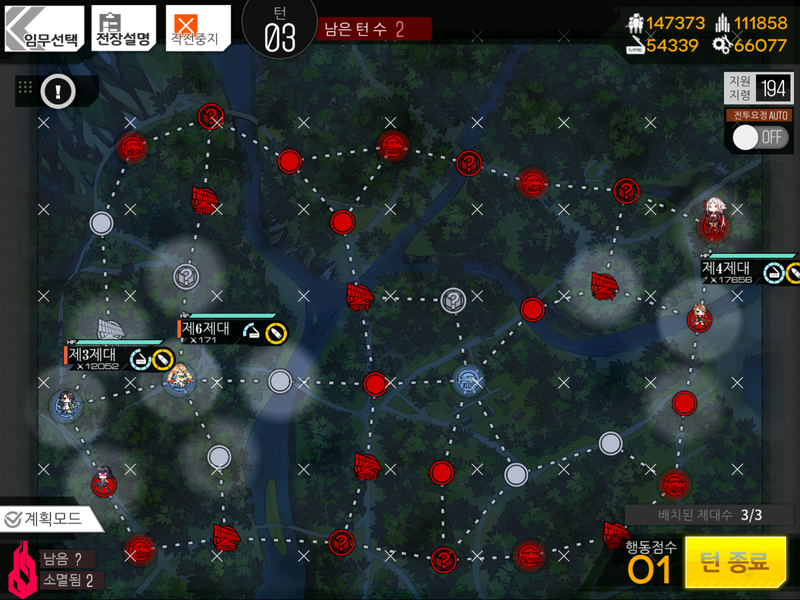 If you can clear Night Missions in Area 3 or 4, You are more than well prepared to tackle the whole campaign. 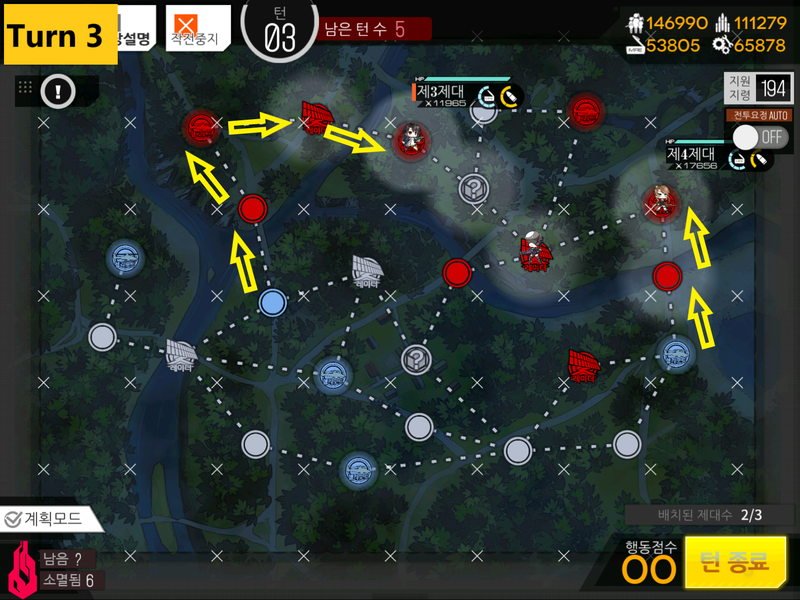 While Mission 1 is regular Night mission, other 3 will be a Boss run: You will need to find and beat the boss multiple times in order to progress with the story… So let’s get to it. [07/18/2018]: Bug is identified and fixed by MICA Team! Now you can actually avoid missiles. [07/17/2018]: As of launch, Ouroboros in 1-4 Boss has 100% accuracy for her rocket attacks, which was ruled as bug in KR server and patched. So until then unless if your Echelon is well tanked and equipped, I strongly discourage running into Ouroboros. Map View: The Yellow X mark means that enemies won’t spawn at the Helipad. Others will or not confirmed as of this writing. Turn 1 consists of capturing another helipad at the bottom of the map. 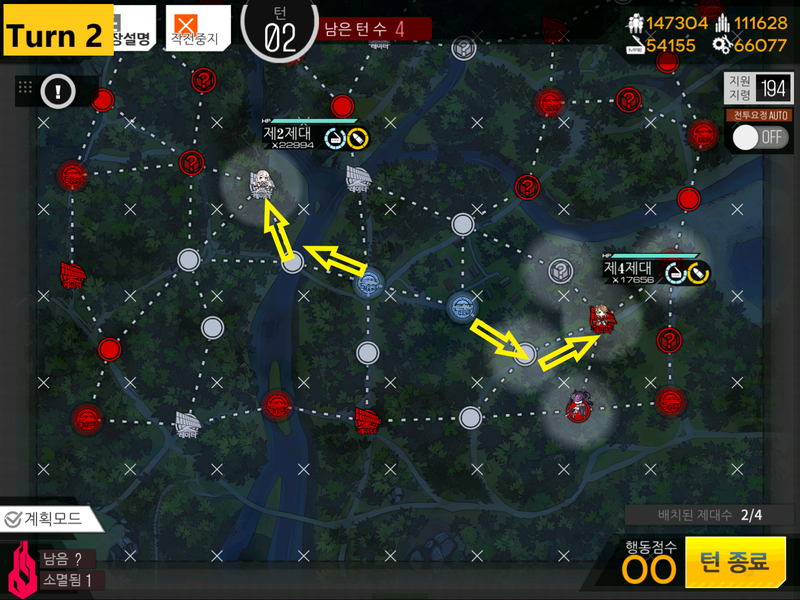 Turn 2 follows route on the bottom right depending on if enemy unit is on radar or the bottom node. This helipad does spawn unit so it would be best to cap it now. 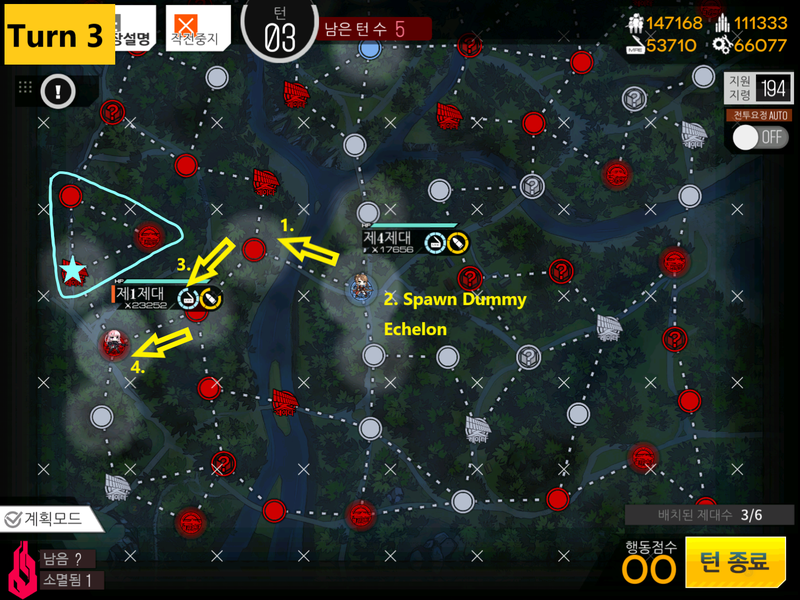 Echelon in the center can move to left. 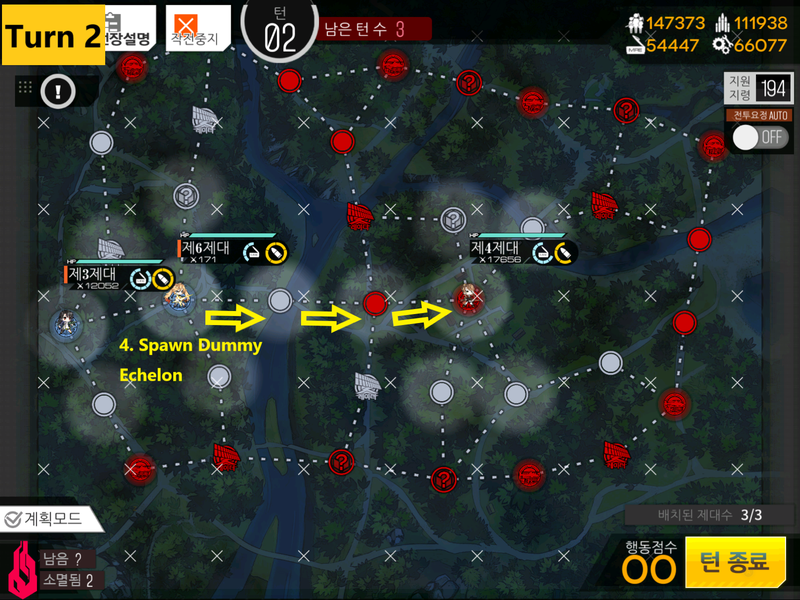 This is where you can also spawn Friend Echelon if you like and set it to eliminate, which will likely to take center route. Since we know that enemy helipad on top left doesn’t spawn units, we can ignore and capture next helipad on the list. Right side does the same. 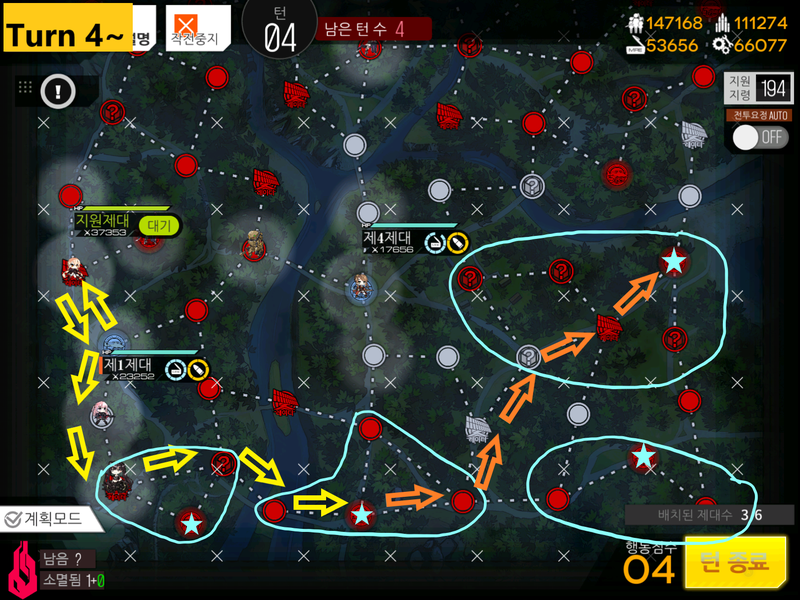 You should have 7 movement points at the beginning of the turn and only few areas to cover and kill remaining units. Can be beaten with: 2 Echelons at level 50+ with 3x links. Mix of RF and AR recommended. 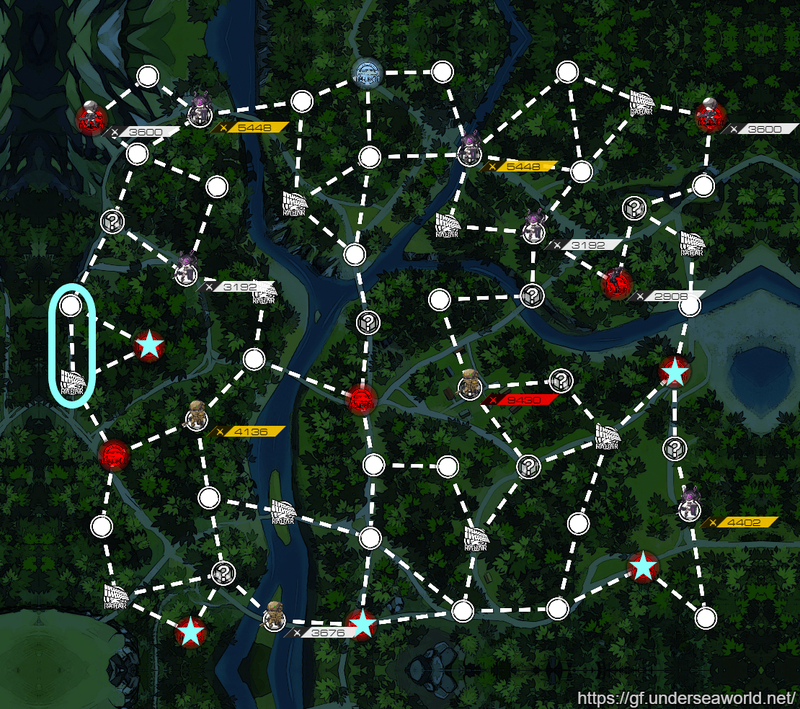 Map view: There’s very limited turn for such large map, but don’t despair! There’s set area where Hunter spawns. area highlighted in yellow blob is where Hunter will be located. Going to start Turn 1 by grabbing a helipad and spawning another echelon. This Echelon has some chance of having to deal with either armor or regular enemy type units. So form echelon accordingly. Echelon in charge of hunting down the Hunter is moving to take Helipad in the center. Spawn a Dummy Echelon on the 2nd Helipad by other echelon. End Turn. This is where little bit of Analogy comes in. 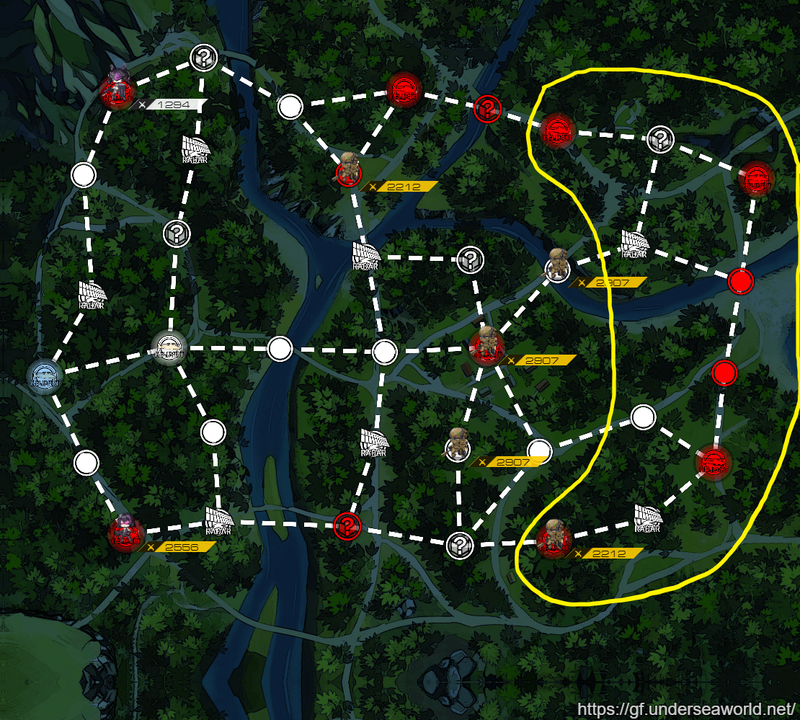 You want to take the route that has more red nodes on the path, in my case, Yellow. 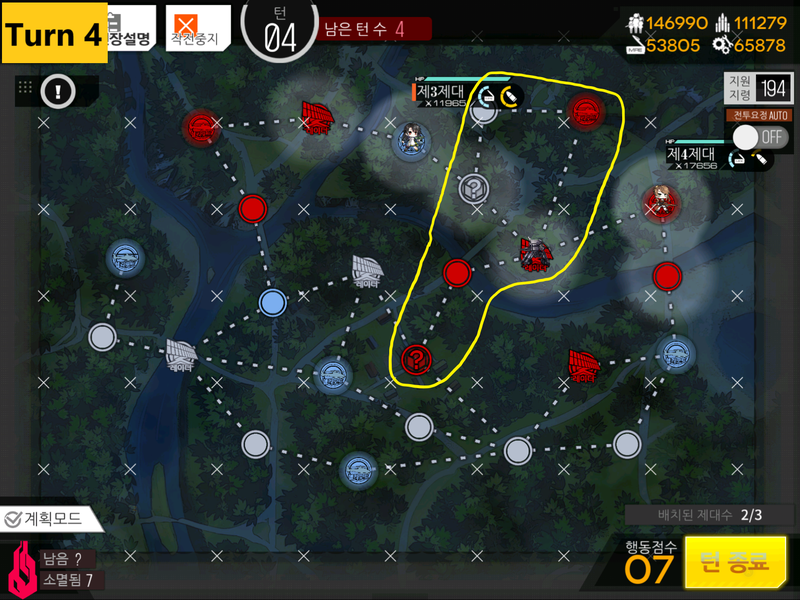 If you do no find Hunter after moving along yellow or blue path, you just need to search for uncovered area next turn and you should see her in the dark area. I actually intentionally took the other path to show that you should still run into her or have her in your vision by end of the turn. Repeat Mission to move on to next mission! 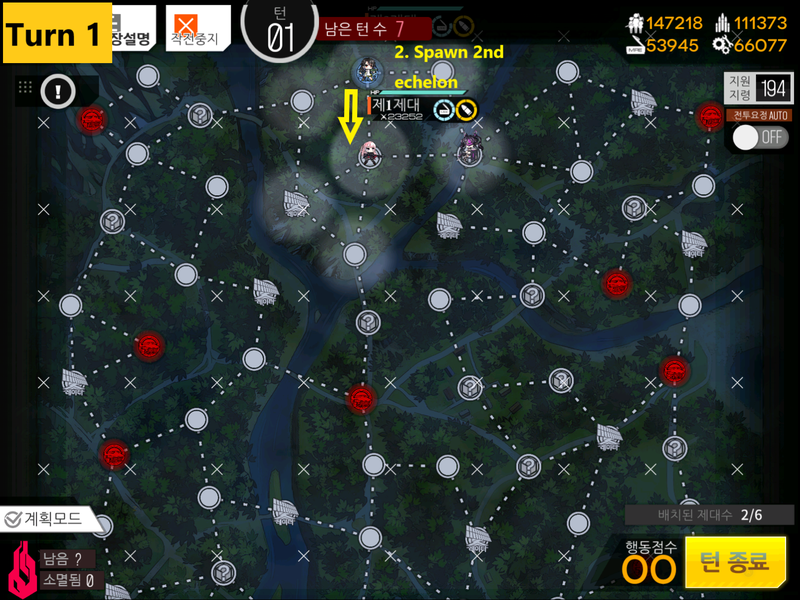 Map View: Another big map, but not too difficult to find the Executioner. Similar to Mission 2, we are moving unit onto another helipad near by and spawning another echelon who can do few combat run. You “can” use AR echelon here but RF or mix echelon is strongly recommended. 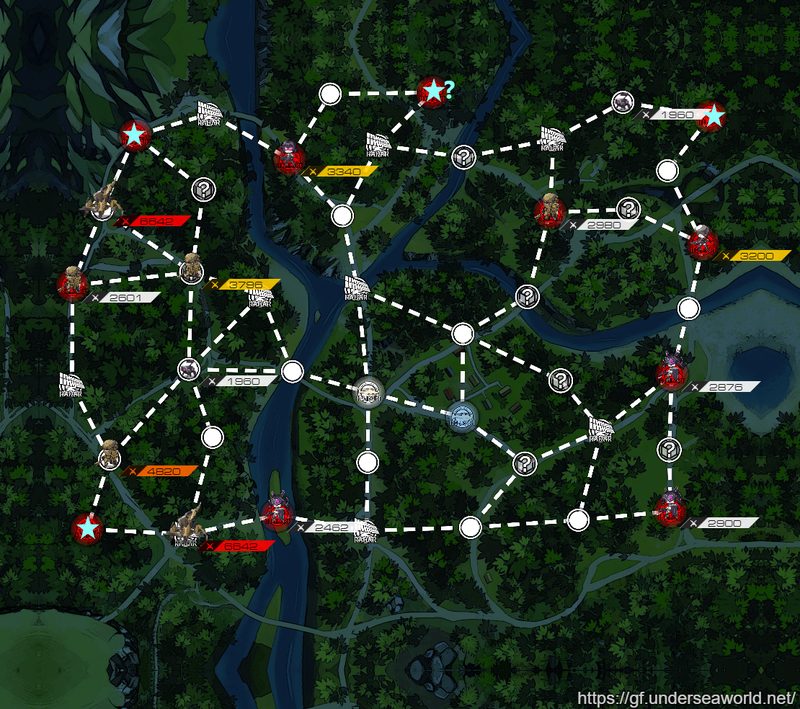 With 4 movement points you have you want to take 2 Radar stations on the center left and bottom right. These 2 radars will reveal about 70% of the map and sometimes reveal the Executioner right away either on bottom left or top left. If so, move in to kill. 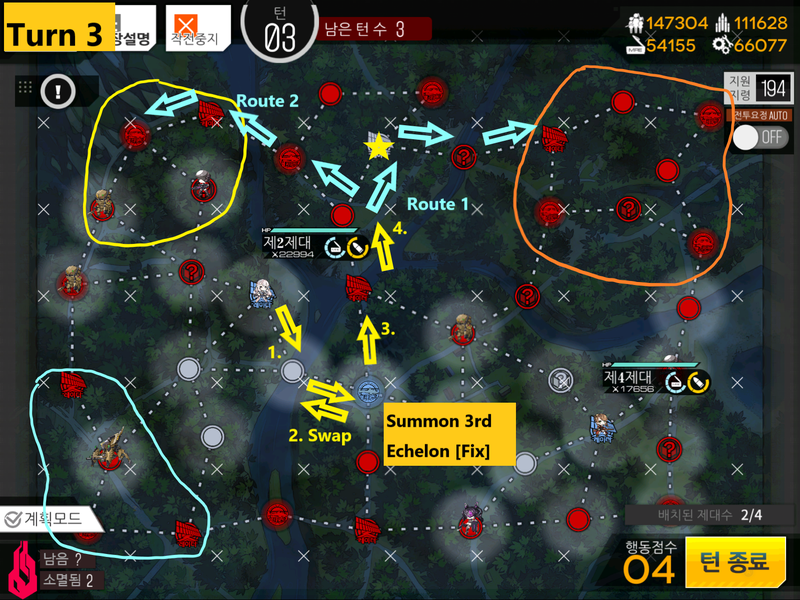 If you do not see Hunter at Starting on Turn 3, you can either reset the mission to try again to save some time, or follow the recommended route listed in yellow than blue arrows the following turn while paying attention to revealed area. 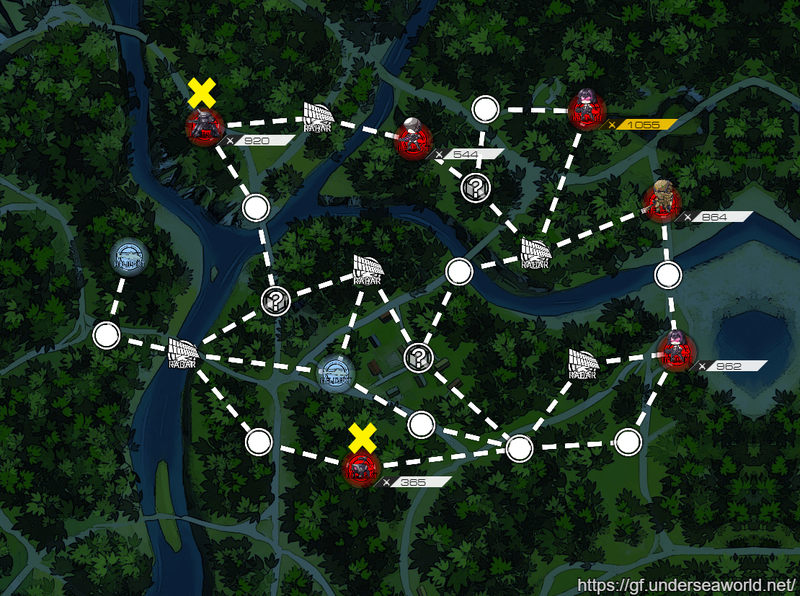 Taking the Radar node on top center [yellow Star] will most likely to reveal where hunter will be. In ‘unlucky’ case, Executioner should be in the orange area. EN server update: We are not allowed to use Friend Echelon! D: So you can either go for 3rd Echelon as back up and follow the rest as intended above, or use the reset method to quickly find Boss. Can be beaten with: 3 Echelons, Boss killing echelon at 4x links at level 70+ and other echelon at 3x links with level 50+, and 1 dummy HG echelon. Why no capes? Because capes slow down overall movement of dolls and this allows Ouroboros to hit you far more times before you can reach her on the far right. Squishy HGs will thank you for following the recommendations. 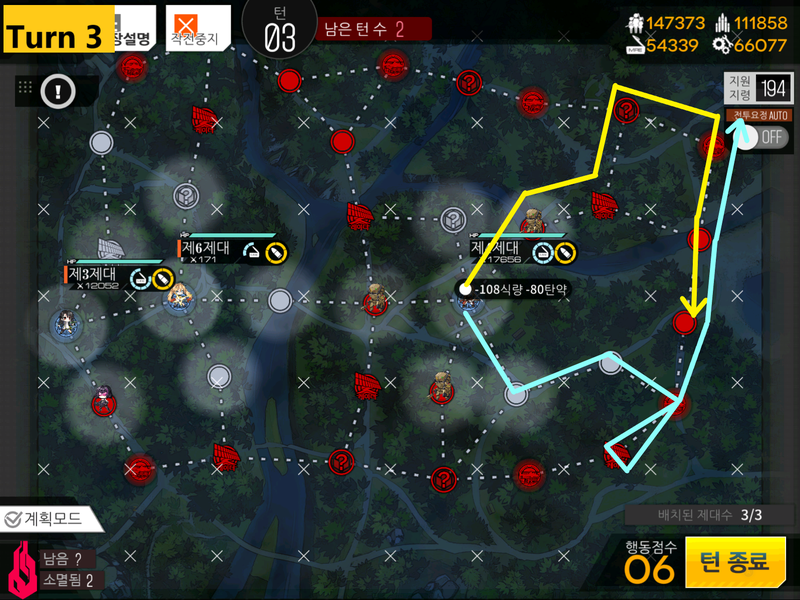 Map View: Another map that tests your luck and patience… Blue stars are locations that Ouroboros could be at… one on the center left is the quickest and easiest one to find. Move unit down one, then spawn helipad defending echelon. Doesn’t have to be strong since it only deals with low strength units. Move 3 down to capture center helipad. On the way there’s a chance you can run into Manticore, although a rare case. So make sure your echelon can handle armor units. 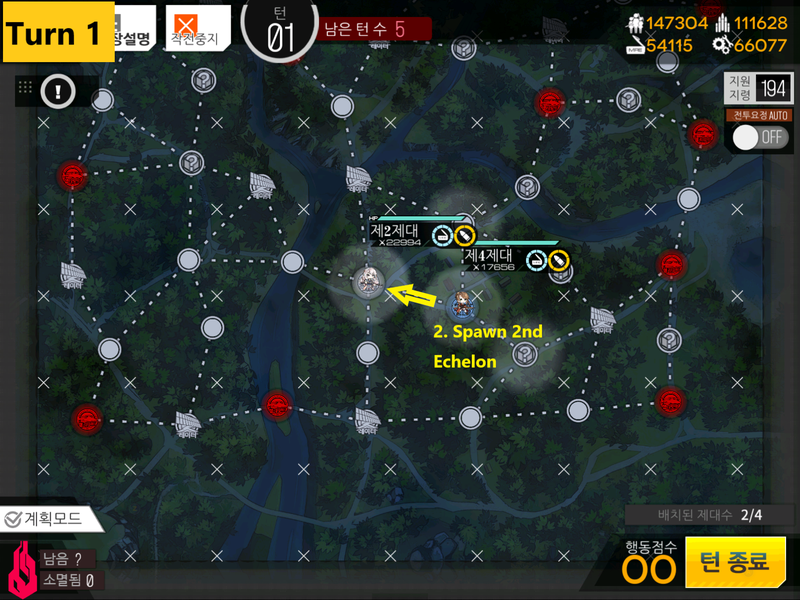 Move main Echelon unit left 1, spawn dummy unit. 99% of the time, this helipad will be unchallenged once taken, but if you want to be absolutely sure, spawn another echelon that can fight armor units. 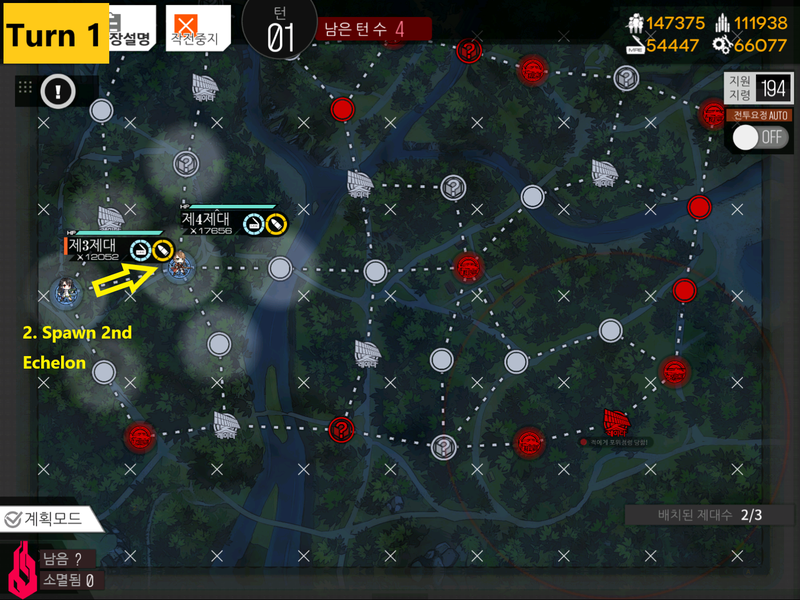 Then move main echelon left 2 more times to take helipad. There will be times when this helipad will be impossible to take. If that is the case you can improvise your movement and resupply point. Also there’s a chance that you will see Ouroboros at the blue star… congratulation you don’t have to spend 3 more turns to look for her. If you are unlucky, you will have to follow the path shown above in yellow [Turn 4] and then followed by Orange path [Turn 5]. This covers almost all area that Ouroboros will be hanging out at, unless you really get unlucky and she decides to chill all the way in the bottom right corner. Then spend another turn looking for her by moving down from end of Orange path on Turn 6. EN Server Update: No Friend Echelons! 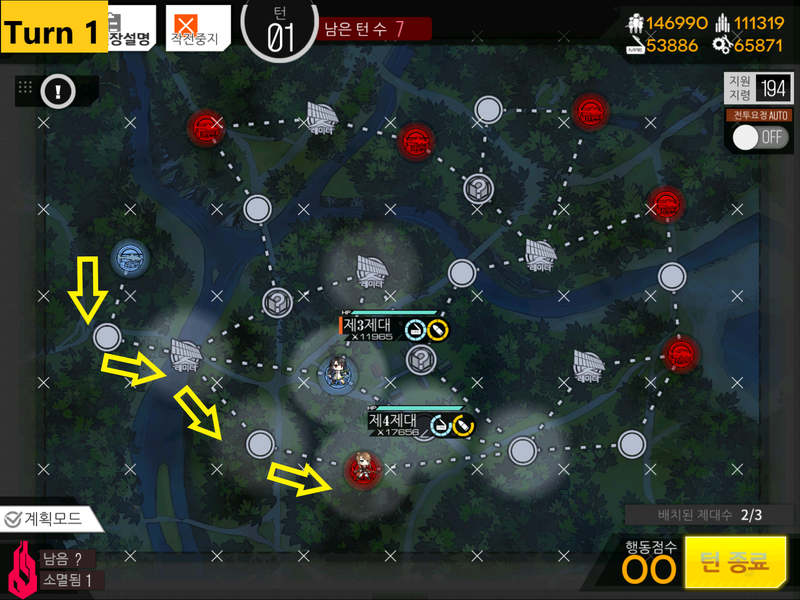 D: You will have one less movement points follow turns, but if you still follow the path shown above, you will be able to cover all area for Boss Spawn. Just watch out for resupply points! Are you having trouble finding Ouroboros? Wasted tons of resources already on failed missions? Well I got a thing for you…. Use it by inputting enemy’s location on beginning of 2nd turn and it will give you where the cursed Boss unit is hiding at indicated by purple circle[s]. It works 90% of the time 100% of the time! Try at your own risk.